The Meals on Wheels program provides a hot noon meal (and optional cold evening meal) designed to meet the nutritional needs of those who are homebound and/or disabled and unable to shop for groceries or prepare a meal for themselves. The typical recipient is 60 years of age or older and lives alone. However, eligibility is based entirely upon the individual's need (being essentially home bound, unable to prepare meals, unable to shop for food or purchase meals, no cooking facilities, etc.). There are no income requirements or restrictions, though recipients are asked to contribute ($2.50 suggested anonymous donation per meal) towards the cost of the meal. No one will be denied service due to inability to contribute. 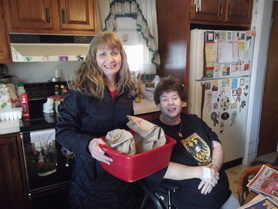 Anyone can make a referral to Meals on Wheels by calling Multi-Service at (610) 367-6957. The Meals on Wheels Case Manager will make a home visit to assess eligibility. Eligible individuals will begin receiving meals within the next week. Those who are not eligible may be referred to The Center at Spring Street which offers a variety of programs and services including a hot noon day meal to anyone age 55+ or disabled. The length of time that an individual receives meals is based on need. Meals on Wheels can provide short-term assistance for someone recuperating from an illness or injury. Long-term service can be provided if necessary. The Meals on Wheels program provides individuals an opportunity to remain independent in their own homes. ​All meals are prepared on-site at Multi-Service under the supervision of a registered dietitian whose intent is to provide a balanced, nutritious and appealing meal. Most noon meals include a portion of meat (protein), one vegetable, and one serving of starch (such as potato or rice), bread or roll, margarine, 1% milk, and dessert or fruit. Cold evening meals include a sandwich, side, dessert and a drink. All prepared meals are low-salt, low-fat and low sugar and therefore accommodate most prescription diets ordered by physicians. The Meals on Wheels program is funded by the Berks County Area Agency on Aging and Montgomery County Aging and Adult Services. 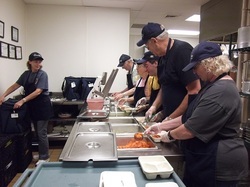 The meals are prepared by a chef and prep chef who oversee a host of kitchen volunteers. Trained volunteers deliver the meals 5 days a week. In the event of enclement weather, meal delivery may be canceled. Emergency "snow packs" are available to recipients to be used for these occasions. Scams seep into every form of business, including Meals on Wheels. At no time will a Meals on Wheels staff member call you requesting information on the status of your mortgage, rent, or bank balances. ​Qualification for the Meals on Wheels program does not require a financial report. If you receive this type of call, please hang up and report the call to our office immediately. Call 610-367-6957.